Early this week I sensed the onset of autumn. I always have an intense hit of sadness for a day or so saying goodbye to the summer, but then I relax and surrender to the richness and beauty that autumn brings. The weather has been very kind this season – pretty much warm and dry for three or four months – and certainly fine since we moved to the wild field around mid summer. But today its gusty and cloudy and when the sun is covered by the scurrying clouds, quite cool. Last night, Pat and I stood with a new friend and gazed at the sky to watch the meteor shower as the earth passed through the debris from a shattered star. (It’s taken me 46 years and to be living in a field to learn that this phenomenon happens every year!) Shooting stars galore! Nature’s own firework display! It was well worth the cold feet and cricked neck and there was something very special being with my two companions sharing gasps of “There’s another one!”. Certainly beats sitting in a house watching TV. The meteor shower is supposed to herald new beginnings, especially coming just after a new moon. We took this as an auspicious sign as our friend had settled arrangements that very day to move to the field with us. No ordinary chap, Premanand is a Hindu Sadhu, or holy man. In his late 50’s and originally from Yorkshire, he has spent considerable time in India living as a full time spiritual devotee. 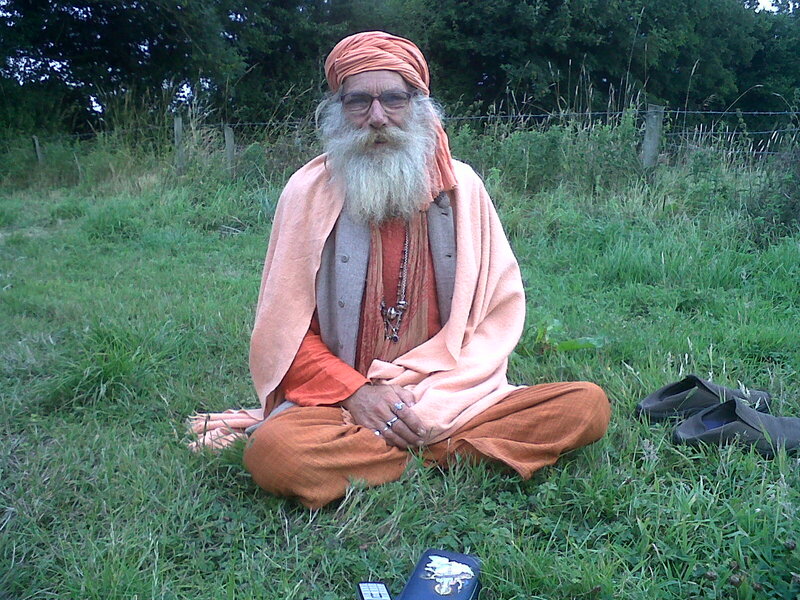 With his long beard and traditional orange robes, his appearance is striking even in the rural edges of the ‘alternative capital of the UK’, Totnes. Just a few weeks ago, Premanand followed his hunches to move from Sussex to the Totnes area and happened upon our village. The kind ladies in the community shop directed him to our field as a likely place to pitch his tent while he looked around. Although this exotic character became an immediate gossip sensation in the village, Pat and I felt comfortable with him right away. We didn’t think it was any accident that Premanand had intuitively homed in on another pair of spiritual fringe dwellers – one of them a former ordained Buddhist and the other nicknamed ‘the Holy Cornishman’. When Premanand left after his initial reccy a few days later, we were surprised at how much we missed him. As his sacred fire slowly burned to nothing there was a vacuum of positive energy where his tent once stood. So we were pleased when he returned and asked if he could stay in the field for a while. I suddenly remembered that there was an inexpensive little caravan for sale in the village. At first I’d looked at it for myself, thinking it might make a good writing space, but then I realised why it had come into my sights – it is a perfect starter home for our resident holy man! Pat and I find Premanand’s peaceful way of life very compatible with ours and we’re happy to have him as a fellow field dweller. Having lived a semi-monastic life for 10 years and travelled in India myself, there is something very familiar about his simple lifestyle and daily devotions. I was chuckling to myself the other morning as I sat to meditate and noticed that Premanand’s bell ringing and chanting was louder than a nearby farmer’s chainsaw. I thought I might as well join in the chorus and belt out a loud Ah meditation myself! In my last blog – Be Careful What You Wish For! – I posted a video of me introducing the Ah meditation – a fantastically powerful manifestation practice. Here’s the video of me actually leading through the meditation. By all means take 10 minutes and have a go. All you need do is relax, listen and join in to manifest your dreams! Apparently, during the time between our last full moon (30th July) and the new moon this Tuesday (10th Aug) there was an astrological grand cross. I don’t know much about astrology, but I was told that the particular planets involved describe a time of ‘shadows revealled in relationships’ – in other words, a time where all our relationship diffculties come to the fore. Of course, fresh awareness of difficulties yields an opportunity to transform and heal them too. Not knowing about the relationship astrology at the time, Pat and I made a sudden decision to drop in on a family pub lunch get together on Wednesday. We’d heard that one of Pat’s two sisters was making a visit to their mum in Saltash, Cornwall, only 40 minutes drive from us. Pat has been patiently waiting for this sister to let go of an upset she’s been carrying about him for a long time and its been seven years since they’ve seen each other. The two of them had a somewhat mending phone conversation a few months ago and so we thought that perhaps the time was ripe to heal it once and for all. We decided to arrive at the family lunch unnanounced. The less opportunity for anticipatory anxiety and the build up of defensiveness the better! And so we burst in, all smiles and calling out “Surprise!”. Our ploy worked and Pat was rewarded with one of the most moving encounters he’s ever experienced. Clearly delighted, his sister threw her arms around him and wouldn’t let go. A wonderful, happy, fun filled lunch ensued, with Pat’s spirited 88 year old mum coyly chilled about having all three of her children together at last. For me it was just wonderful too. With Pat’s precarious health, our opportunities to go out together can be all too infrequent. This was the first time he’d left the caravan (other than a couple of strolls to the nearby village pub!) since we moved. Prior to that, he’d just got himself well enough to visit his baby grand-daughter whereupon we all caught her ‘baby cold’ which in Pat’s case developed into weeks of bronchitis. Maybe this explains why he is such a recluse! We are hoping Pat has no ill effects from this latest outing, however. Our lovely friend and colleague, Rachel Elnaugh (business mentor and former Dragon on Dragon’s Den), has invited us to her entrepreneurs barbeque event in Derbyshire next weekend. Rachel has been a superb friend to us and a keen supporter of our wild field living experiment. She scoped out a motor home for us (a converted mobile library bus in fact!) that was on sale near where she lives – going incognito so as not to alarm the vendor. Having just got hold of her Flip video camera that morning, she filmed her charming but thorough interrogation for us to see. Little did the poor chap know he was being grilled on film by a TV Dragon! Here’s a a couple of videos of Rachel and I discussing one of our favourite topics – Feminine Wisdom in Business. This was our first ever meeting and ‘getting to know you’ chat back in January of this year. I can hardly believe we’ve only known each other for eight months! In the end Pat and I acquired a couple of caravans rather than a motor home. (Although we’d love a Winnebago one day.) Being psychic and therefore highly sensitive, Pat is so much happier living in a mobile home in an open field rather than a cottage surrounded by others. It’s taken more for me to let go of living in a conventional house. Part of this has been my maternal desire to provide a good ‘nest’, but I also discovered that I was more attached to what a pretty country cottage added to my professional persona than I thought! But by jove, I think I’ve done it! Seven weeks in and I’m thoroughly adjusted and lapping it up. The quality of life in the wild field is simply wonderful and the people and planets around here quite exceptional! This entry was posted on August 14, 2010 by Maggie Kay. It was filed under Uncategorized . As always a wonderful, real and heartfelt blog. I like your description of the shooting stars. We too have been searching for shooting stars – it’s a wondeful way to gawp at the heavens and wonder at the beauty and magnitude of the universe. Hey Liz, thanks so much. Your comment came through almost as soon as I posted the blog – must be a record! I’ll think of you and Stu next time we are star gazing! Can we come and live in the field with you????!!! Thankyouji yes it was wonderful stargazing and so lovely to be accepted with warm welcome and love. It is said, nothing happens without the permission of the Mother, and Matadi has certainly guided me unerringly to the place of my dreams, jai Ma Vindhya Varsini! Thank you, dear Premanand. The effortless flow of your journey here definately denotes divine guidance! We are looking forward to filling the air at the wild field with spiritual vibrations too. See you very soon! Hanji. I should be down hopefully with elder son Ben 1st w/end Sept, after Krishna Janmashthami.